Drought Over With a Vengeance, Now … Floods? 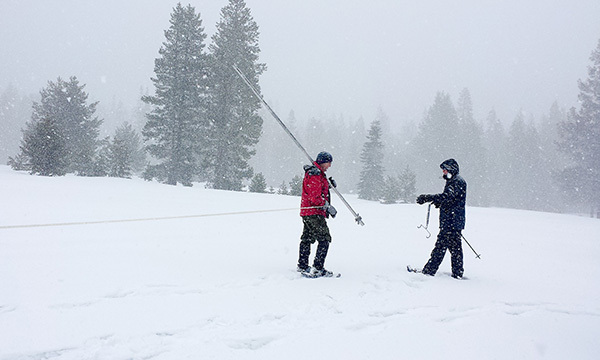 Frank Gehrke, chief of snow surveys for the California Department of Water Resources, conducts a snow survey at Phillips Station on March 30, 2017, with Nic Enstice (right) of Sierra Nevada Conservancy. SACRAMENTO (CN) – Citing risk of spring flooding after a historically wet winter, California officials said the Sierra Nevada snowpack is 190 percent of its long-term average for May 1. The drought-busting winter has the Sierra Nevada snowpack, which provides the state with approximately one-third of its water, at its deepest in May since the El Niño winter of 1998. Regulators said managing the spring and summer snowmelt will present a challenge, as most of the state’s major reservoirs are at or above storage capacity levels, including the largest reservoir, Shasta Lake. “The thing we’re looking out for is primarily the southern Sierra, where we have full reservoirs and in some cases a huge snowpack,” said Frank Gehrke, chief of the California Cooperative Snow Surveys Program. 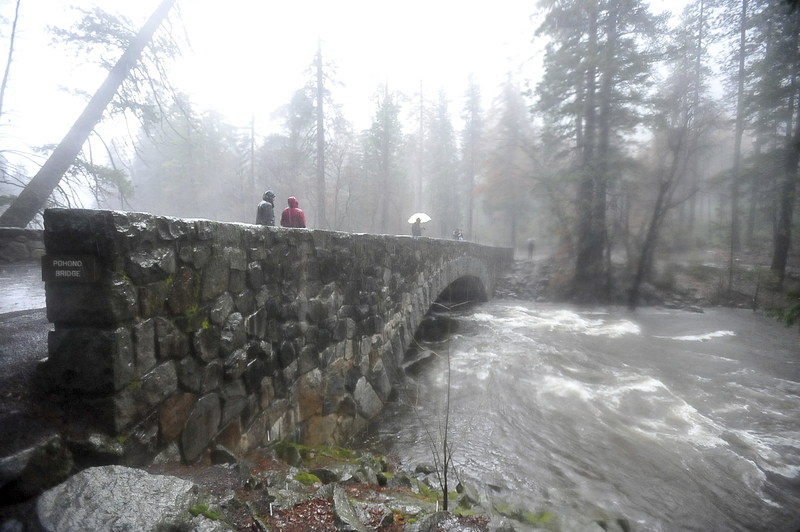 With much of Northern California experiencing above-average temperatures, forecasters have warned that the Merced River could overrun its banks and cause flooding in Yosemite National Park. Warm temperatures are also increasing snowmelt near Lake Tahoe and the Truckee River is expected to reach flood stage by Friday. While Gov. Jerry Brown ended the state’s drought emergency in April and regulators moved to roll back water conservation restrictions, the Department of Water Resources said it hopes the ample snowpack doesn’t “wash away” residents’ stingy tap habits learned during the drought. “California’s precipitation is the most variable in the nation, and we cannot afford to stop conserving water,” acting Department of Water Resources Director Bill Croyle said.